You’ve probably have faced a data analysis scenario where performing calculations for a year-to-date aggregate meets reporting needs. And of course, for most data analysis cases involving dates, Year-to-date comes to be a widespread de-facto standard of evaluation. As some of you may have experience, achieving year to data analysis, based on a selected year and period, in Excel is not straight forward. I have memories of building this type of aggregation, based on a selection, using the Excel Choose function. The are many different ways to do achieve this, but none as simple as what is possible when using Power Pivot in Excel or Power BI. Fortunately, along with the appearance of Power Pivot and DAX, a bunch of useful tools and functions showed up, known as ‘time intelligence’ functions. One of these is TOTALYTD, the Year-To-Date calculation of Power Pivot and Power BI Desktop that serves as a headache-pill for the former Year-to-date calculation methods in Excel. Please note, using DAX there are many various ways to calculate YTD. Let’s take a closer look at TOTALYTD function. This category of functions evaluates an expression over a specified time period. At first glance, its syntax asks for two mandatory parameters: Expression and Dates. In order to get the Year-to-date calculation, you only need to specify ‘what to calculate’, and for ‘which set of dates’. Let’s suppose you have a table with the daily sales of John Doe’s company for 2016 and you need to plot the Monthly Year-to-date sales for the year. You might have noticed the presence of a separate Calendar table in the above image. As per my previous post on ‘Sort by Month Name’, there are many ways to build a calendar table. Previously, I showed how to do this using the ‘CALENDARAUTO’ function. Why is the function useful? For additional date columns like Month, Quarter, and Year, to add these types of columns, a date column must have one row for every day for each year included in the date table. For example, if your dataset has dates from February 1st, 2015 through October 30th 2015, and you report on a calendar year, you will need a date table with at least a date range from January 1st 2015 through December 31st 2015. Every year in your date table must contain all of the days for each year. The ‘CALENDARAUTO’ function returns a table with a single column called ‘Date’, this contains a contiguous set of dates, calculated automatically based on data in the model. 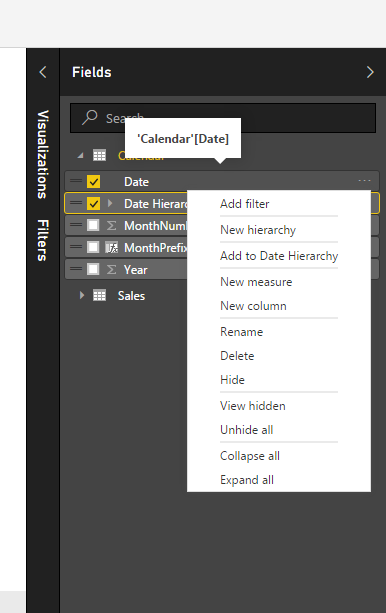 As good as this function is, as mention in my previous post, as it is much quicker, my preference is to create a complete dynamic calendar table in the Power Query section of Power BI Desktop. A table with all the dates between the two specified dates will be created. Now we need to create a relationship between our ‘Calendar’ table and the ‘Sales’ table. Use a many-to-one relationship from ‘Sales’ to ‘Calendar’, which can be created in the Relationships view by clicking and dragging the ‘Date’ column label in ‘Sales’ table onto the ‘Date’ column in the ‘Calendar’ table. In Report view > Fields pane, select the “Year” field of Calendar table and right click on it, then click “New hierarchy”. Rename the hierarchy to “Date Hierarchy” by right clicking on it and choosing Rename. Now select “MonthNumber”, “MonthPrefix”, and “Date” fields of the Calendar table, and add them to the hierarchy by right clicking on them and choosing “Add to Date Hierarchy”. Time to write some DAX! And in the formula bar, type: SumOfSales = SUM(Sales[Sales]). As the name denotes, this is a basic sum of the values in the ‘Sales’ column, which can serve both as the basic re-usable measure and as a guide for checking correctness of our YTD Sales calculation. The simplest naming convention serves as an example only; these measures can have any name. Voilà! On the right hand side is plot of the YTD Total Sales. Please leave comments, or, if you require any further help, contact us. Johann is the founder of Data Bear and specializes in Power BI Training and Consulting. Empowering organisations to move from a time consuming frustration with reporting processes into modern dynamic interactive visualizations is what he takes pleasure in. Great post, thank you. How would you also add a “Previous” year to date calculation – so you could compare this year to date with the previous? There are many ways to achieve this through DAX, one of them is to use the SAMEPERIODLASTYEAR function. However, if your report has a year slicer (filter), as the user might select more than one year, that formula would not be suitable. hum, All these TOTALYTD(), DATESYTD() Not works for fiscal year, any work arround? Thanks. =TotalYTD([measure],’Date Table'[Dates]) will work based on calendar year. Excellent article, Johann. Its the best resource I’ve found to help me create some year-over-year reports for giving with regards to fundraising. I’ve gotten everything to work down to the “YTDSumOfSales” step. My “right hand side” chart has no data in it. My YTDSumOfSales measure is blank. Any ideas what might cause that? Also, my month prefixes in the left-hand chart are sorting alphabetically rather than chronologically. Any ideas there? Ah. Figured out the month name sorting part of this. Did you get your DAX measures to work? I did sort out the month sort thing, but I haven’t gotten the DAX measures to work. I can’t imagine what’s wrong. I feel like I’ve tried everything. For TOTALYTD(), does the measure input have to a column or measure? I feel like I tried both. What I my amount input, donation amounts in dollars in this case, has a rouge line with a blank or non-number value or something? I can sum and average that column in other places, though, so that doesn’t make sense. I also tried adding an ALL() filter and explicitly stating the year end date but to no avail. If you have any ideas I’d be very appreciative of your thoughts. The possible cause can be in calendar table. By default, the YTD measure will be calculated for the last year in calendar table. Perhaps, the last year in the calendar table is greater than last year in the fact table. If you cannot troubleshoot this by checking the calendar table, and its relationship etc. I suggest providing me with the workbook and I will fix this for you. Any risks here I don’t know about? I don’t see any risks. This schema will work, but in case you have many different reports, as it is more flexible and easier to replicate, using a Power Query calendar will be better. “I don’t see any risks. This schema will work, but in case you have many different reports, as it is more flexible and easier to replicate, using a Power Query calendar will be better. You can achieve this only one measure: Sales YTD = TotalYTD([Total Sales],’Calendar'[Date]). And add ‘Year’ column as a legend, ‘Month’ as an axis. That’s giving me the individual totals for each month, but not a running total from one month to the next throughout the year. Is there something I’m missing? I figured out one of the things that was confusing me with my YTD results. When I use a calculation to sum for the previous YTD, the result is showing me the total at the end of the current period (month) year-to-date, not the day. For example, if I want the sum of previous YTD for Nov 10, the result is for Nov 31, not Nov 10. How could I create a previous YTD (fiscal year) total that compares by day instead of by period? It seems it may have to due with my date table. I used CALENDARAUTO() in this report. It seems I should have used your Power Query date table so that the date table ends on the same day as the data. Is there a way I can trim by date table without creating a new date table from scratch? “Let’s say you’re halfway through a given month – for example, pretend today’s date is July 15, 2016, and I want to know how we’re doing, year to date, versus the same time period of 2015. In that case, I don’t want ALL of July 2015 included in the comparison! That would be “unfair” to 2016, because I’d have less time in 2016 than the comparison period in 2015. But if my Calendar table contains all of the dates for July 2016 – it goes slightly into the future and already has rows for July 16, 17, and so on – well guess what? The formula above WILL include the entirety of July 2015 in the comparison. Thank you for your article, I have a question regarding How to restrict visualization on current year, but I need a dynamic filter so in 2016 the end user has no option to see past years data. 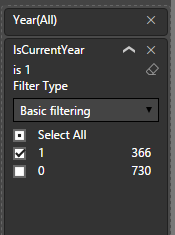 In 2017 the filter works automatically to filter data only for 2017.
after that you can put this column as a visual, page or report level filter. Will need to take a look at the data model to pinpoint the issue. Could be some kind of unwanted filtering going on. Can you please help me out the below DAX function for TOTALMTD. I have a TOTAYTD to starting with 12-019(Dec – Nov)..this work fine. Samething i applied for TOTALMTD..but its not working. When calculating MTD, you don’t need to specify the end of the fiscal year. You mentioned “12-019”, I’m unsure of this date format. Are you saying that your your fiscal Year/Month starts in the middle of the calendar month? I am facing issue calculating the YTD using TotalYTD function as in my fact table i don’t have the date as we are calculating monthly data, so fact table contains month number and calendar year, I have created a intermediate table to join this to my date dim based on the month year calculation, so now I have 3 table sin powerBi model, Month year, dim date , fact table. when I am trying it calculate the YTD basically (year to month ) I am not getting the correct values. Can you please guide me on the same, how can I calculate the total sum based on month and year i.e year to month, year to month Last year. How to calculate year to end (YTE) value? Any leads would be appreciated! Note: In order to use this function, you do need a calendar table – for more info on how to create a calendar – check out this blog. To break this down, the measure calls the year to date values using the TOTALYTD function, where you have to specify your primary date key from the calendar table and then specify the end of year date. In this example we specify the last day of December as the “12/31”. Depending on your business, you can change this end date to suit your needs. By default the first day of your YTD will be the next day of the end of year date you specify. Please check that both fields have the data type showing as ‘Date’, not Date/Time or anything else. Has anyone come across an issue where calculated column using TODAY() – ‘some date value’ is working fine on Power BI Desktop but when published to Power BI the date difference is never re-calculated. It is stuck in a “date” when the file was published to Power BI. E.g. If at a time of publishing BI file the time difference was 13 days, it stays 13 days indefinitely as if TODAY() never changed. Other forums suggested a solution using Direct Query. My data comes from two sources, a URL source and Excel file. I cannot implement Direct Query. The only place I can apply any calculations is inside Power BI file.